Download Latest XDMan for Linux -Xtreme Download Manager also known as XDM and XDMan is one of best download manager in Linux which free and open source download manager based on java, a powerful tool to increase download speed up-to 500%, resume broken/dead downloads, capture FLV videos from any site and schedule downloads and multi platform software application. XDMan supported pause and resume downloads even broken downloads are resume-able, grab videos from around the internet and offers schedule downloads. Can integrated with any browser such as Firefox, Google Chrome, Opera and etc. This download manager will automatically launch and download any files from your current web browser, so it makes you easily. Until this post published, Xtreme Download Manager was updated to version 5.0.4 which completely bring new User Interface including new icon, changed color scheme based black and blue with flat design, and said XDM 2015 as the title. Actually we have 2 options that we can choose to installing XDMAn in our Linux Ubuntu 12.04/14.04/14.10/15.04/15.10, Linux mint, Elementary OS and derivatives. Let start the guide! 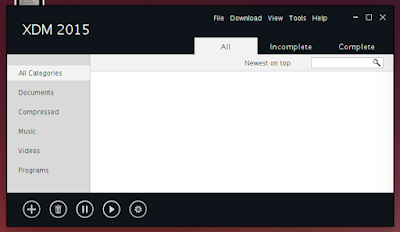 The next thing you should to do is integrate this download manager into your browser. From XDMan main menu, open Tools > Browser Integration. Open your current browser, then drag XDMan icon then drop to new tab in your browser. A popup window will come to ask install this extension. If need, you can see the screenshot at How To Install And Integrate XDMan Into Web Browser - Firefox, Google Chrome, and Chromium. Some problems usually happen is when installing XDM extension. Here's the message "The add-on could not be downloaded because of connection failure on 127.0.0.1"
So that's all I can write about Install Last Update XDMan 2015 With New Fresh UI as best download manager in Linux. Hope you've enjoyed reading this tutorial as much I’ve enjoyed writing it. Let us know about speed, issues, etc by comment below this post.